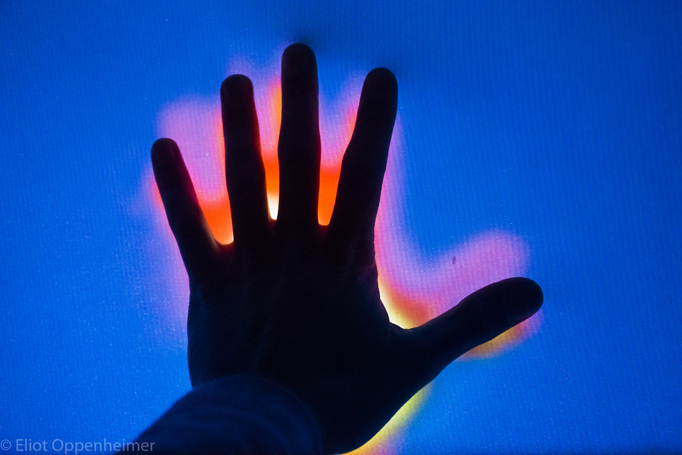 Thermal Gestures is an interactive artwork and an engineering invention. It explores the electromagnetic spectrum, thermal emission and heat absorption. The exhibit is appearing at science museums and other public venues. 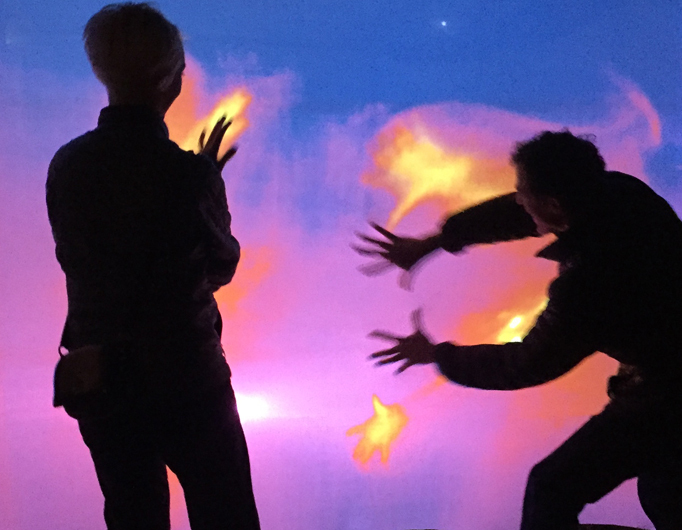 "Interactive Artistic Presentation System with Thermographic Imagery"
Thermal Gestures is both an artwork and an invention. It utilizes a thermal infrared camera, custom computer software, a compliant and thermally-sensitive stretched fabric wall and a synchronized projector. This introduces a narrative into the piece around the process of innovation, invention, engineering and iteration. 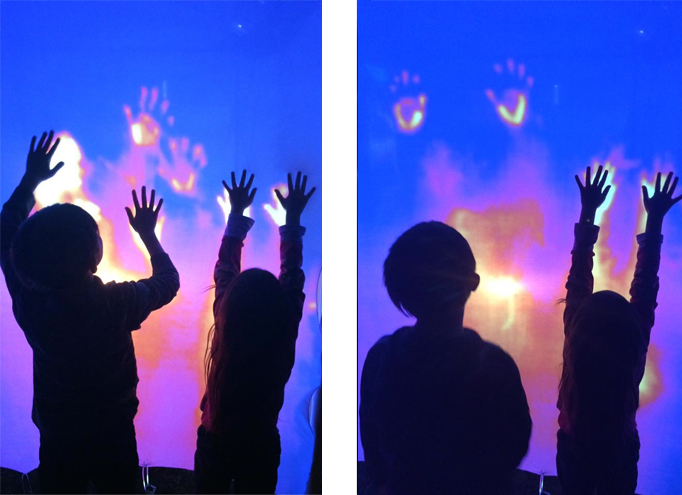 Thermal Gestures a highly tactile interactive experience where touch and breath become visible. The work creates a sense of awe and wonder in the public. As the visitor touches the stretchy wall, their hands, arms and legs become visible. As they move across the surface, the fabric retains their body heat and displays the residue of their movement, which slowly dissipates over time. Even the heat of the breath is captured and becomes visible and almost tangible. "... one of the things I find most compelling about the piece is that it teaches us about ourselves - the heat we generate, and the invisible trail/shadow we leave behind...if only temporarily. Your exhibit illustrates that we have an impact on our surroundings in ways we often don't see. That's a HUGE lesson, especially as we try to help people understand ideas such as climate change, where our actions have invisible byproducts that generate tangible effects." "Picture an aura of heat dissipating from the body and dispersing through space like a chemtrail. Or just check out Pinter's 'Thermal Gestures,' ... which is a highlight of three new Dairy shows that began last week. 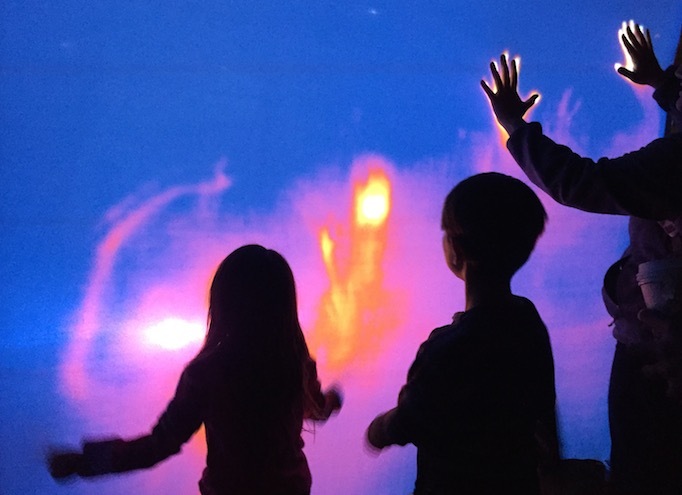 ... Get lost in hand trails by swiping the fabric, see the orange-red glow of warm breath, dance behind the fabric and watch the color that kinetics naturally creates." 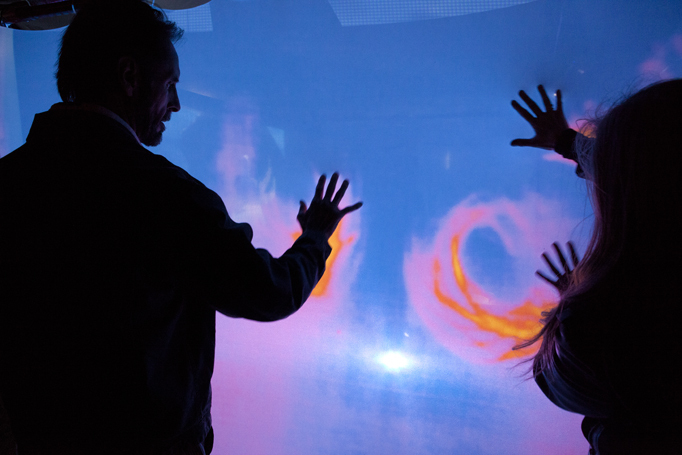 The interactive art piece serves as the vehicle and entry point for experiencing another dimension of the electromagnetic spectrum. 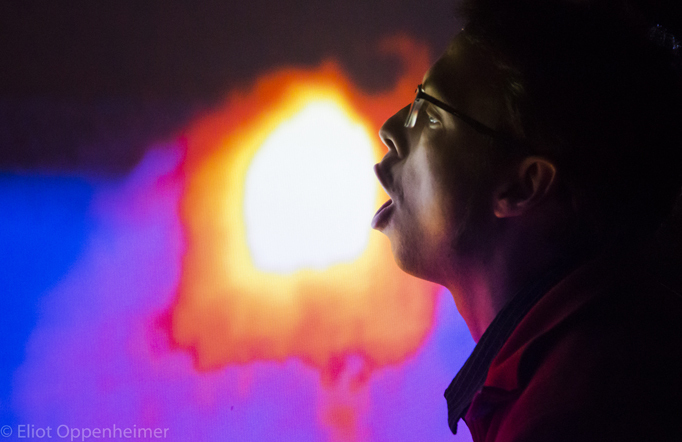 Thermal energy is explored in a visceral and engaging way. Heat transfer and dissipation become visible to the visitor as they play and interact with the surface. The thermal energy exists in the far infrared spectrum, approximately 9,000 to 14,000 nanometers in wavelength. This is detected and converted to the visible spectrum (400 to 700 nanometers) and re-projected back on the surface. First appeared in May 2016 as part of Luminous Gestures, funded by the California Arts Council in conjunction with the LightWorks festival. Exhibited at the Dairy Arts Center in Boulder, CO, December - January, 2017. Exhibited at MOXI (Museum of Exploration and Innovation) opening mid-January 2018.